It's always wonderful to have the opportunity to review a versatile product you can use for seasoning, cooking, and baking. 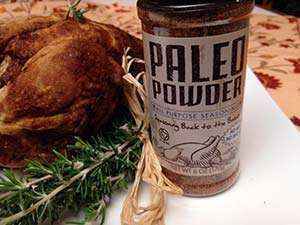 Paleo Powder is gluten-free and also free of MSG. Paleo Powder adds a nice taste to many different foods. I tried it on a frozen hamburger patty before grilling, and it was so much more tender and juicy. I also tried it on chicken before baking. The chicken turned out very moist inside with a crunchy but delicate thickness on the outside. Curious about it as a topping, I tried it on lettuce and it turned a regular Caesar salad into a delicious healthy meal. The powder has the "just-right" combination of chili, garlic, onion, and cumin to make it flavorful, but not overpowering. I no longer need separate shakers for salt and pepper and other spices, as a few shakes of the Paleo Powder Seasoning and food that seemed bland before is now tastier than ever. You can also add a little water to your saucepan while cooking to make a delicious basting sauce. You don't have to be on the Paleo diet to enjoy Paleo Powder. It is the perfect spice for every gluten-free cook's kitchen. Review written by Patricia Seeley. I've used this product on many different types of food. it is excellent and beats any type of Tony Chachere seasoning. use it on eggs, pork, beef, chicken, seafood. I highly recommend it! This article is a paid advertising product review for this Web site. For more information about our advertising programs, including how you can see your ad on this site, please visit our advertising page. I recently had the opportunity to try a gluten-free, sugar-free and starch-free cookie called "Cocoa-licious," which is manufactured by “Yes! To cookies.” I have to be honest when I asked myself, “how good can a gluten, carb and sugar free cookie taste?” When I opened the package, the smell of rich cocoa spilled out, and I discovered that each cookie was topped with a type of glaze that made it appealing to the eye as well. I no longer found myself hesitant to try these cookies, and now I'm glad that I did. Each cookie was soft, moist and had a rich cocoa flavor. I did notice a slight aftertaste which I can only best describe as the same type of taste I get after I take a vitamin, but due to their uniqueness, I have to give these Cocoa-licious cookies a thumbs up. I had no idea that there was such a thing as a sugar, carb and gluten-free cookie, but I can say that this cookie far exceeded my expectations. It would be a great gluten-free snack for anyone who is watching their carbohydrate and sugar intake, and would satisfy a craving for something sweet. Note:Articles that appearin the "Gluten-Free Product Reviews" section of this site are paidadvertisements. For more information about this seeour Advertising Page. I was very surprised when I received a care package of Hail Merry's gluten-free blonde macaroons. I absolutely love coconut and have always had bit of a sweet tooth, but in the past I haven't always had the best of luck with gluten-free macaroons. Usually, I find macaroons to be way too sweet, high in fat and calories or the texture is just wrong. Despite the charming packaging that contained these macaroons, I still had my doubts – but who am I kidding? I love coconut! When I took my first bite I noticed that the texture of these macaroons was soft, slightly chewy, but not overly sweet – I guess they read my mind about my usual complaints about most macaroons – they tasted great. I found the size of each macaroon (just short of the size of a golf ball) was just the perfect size to get satisfaction for a sweet tooth like me, but the best part is that they only have 70 calories and 5.5 grams of fat each! How can this be? Upon further reading of their packaging I noticed that Hail Merry didn't cut any corners when they developed these little bites of goodness! The ingredient list is short , wholesome and surprisingly these macaroons are not only raw and vegan, but are only lightly sweetened with maple syrup. I must also mention that shredded coconut has twice the fiber of oats, and that coconut oil is known to contribute to healthier hair, skin and can help aid proper digestion. I absolutely loved the taste of these macaroons with their real coconut flavor and texture! These macaroons give a "junk food" taste with the quality and nutrition that you wouldn't expect from such a nice little treat – in my book they are definitely worth trying! Note:Articles thatappearin the "Gluten-Free Food & SpecialtyProduct Companies" section ofthis site are paid advertisements. Formoreinformation about this seeour AdvertisingPage. I tried an Acai Berry Chia Bar today that is made by Health Warrior, and was pleasantly surprised. This chia bar is 100% natural and has a nice chewy texture that is also crunchy at the same time, which makes for an interesting combination. The bar is packed with chia seeds to the point where it contains 1,000mg of Omega-3's, four grams of fiber, and three grams of protein...and yet contains only 100 calories and 15g of carbs! For those of you who like to have a quick, healthy snack on hand, this bar is an excellent choice. The first thing I really appreciated about this cookbook, besides the gorgeous photography, is the introductory section called “Ingredients Unveiled”. Different types of flour, sweeteners, and oils are described and the nutritional benefits of each are also included. I like a cookbook that teaches me about what I am putting into my body, rather than just providing me with a bunch of recipes. Of course there are plenty of great recipes for everything from dips to desserts and they are all easy to make, dairy-free, and kosher. This is a great cookbook for any gluten-free kitchen.